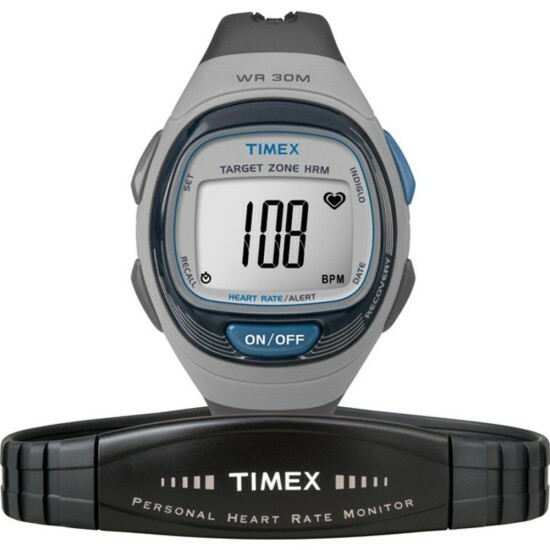 This Heart Rate Monitor Review is all about the Timex Personal Trainer Heart Rate Monitor which is rated one of the best HRMs of today. This Timex Trainer HRM has simple, easy and accurate HRM related meters which is suitable for beginners or seasoned athletes looking for a streamlined HRM. What Does The Timex Personal Trainer HRM Show? It consists of 5 different heart rate target zones which you can set yourself based on your fitness level. It shows the Beats per Minute (BPM) or Percent of Maximum (%Max) and is bounded by upper and lower limits of heart rate zones. Lower Target Zone Limit : It sets the person’s lowest possible heart rate zone which differs person to person. If heart rate limit goes below the set value then the audible alert will sound. Lower Target Zone Limit : It sets the person’s maximum possible heart rate zone which differs person to person and it should not be greater than 240. If heart rate limit goes above the set value then the audible alert will sound. It tells the amount of time during which your heart rate ranges in between the upper and lower target zone limits. Personal Heart Rate Monitor packaging. The number of calories burned during an activity. It depends on three factors including your weight, your heart rate during the activity, and the time you spent in the activity. Your recovery rate represents the change in your heart rate over a period of time. Your Personal Heart Rate Monitor records the change in your heart rate over a period of 1-minute.This parameter shows the result of the most recently taken recovery heart rate calculation. Once you set the Personal Heart Rate Monitor according to your current fitness level then it will automatically show you when you are in the exercise zone or when you are not in the zone. People who want to keep them fit every time and record their fitness levels then this TImex Personal Trainer Heart Rate Monitor is the must gadget for them. This heart rate trainer is easily available at Amazon online store at 21% discount price of $55.37 in two different colors; grey and blue.